The Living Urn for People is a patent pending biodegradable urn and planting system that transforms the cremated remains of your loved one into a beautiful enduring tree, plant or flowers and living memory of your cherished family member! The Living Urn for People is an all-in-one premium growing system that includes all you need to grow your beautiful memory tree from ash with ease and includes our proprietary biodegradable urn, premium planting mix, ash neutralizing agent, aged wood chips, easy to follow planting instructions (to plant in either a large pot or in the yard), and a beautiful bamboo urn cover that serves as a special keepsake box once you plant your Living Urn. This version of The Living Urn can be planted in a large pot or in the yard and does not come with a tree seedling - simply visit your local nursery to buy your favorite tree seedling, plant or flower to grow with the Living Urn! 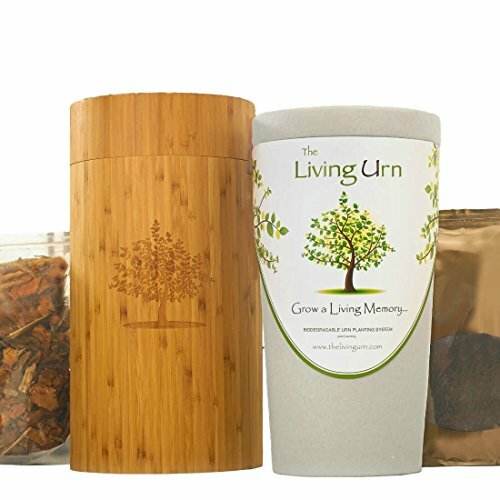 Grow a living memory with The Living Urn! If you have any questions about this product by The Living Urn for People, contact us by completing and submitting the form below. If you are looking for a specif part number, please include it with your message.